I'm looking for a software that offers an easy way to write down notes on my desktop. I do not need a fancy tool with lots of options, just something basic that is available immediately. I used to write down notes in text documents but my desktop soon got cluttered with lots of text documents containing notes and it was obviously not the perfect method. 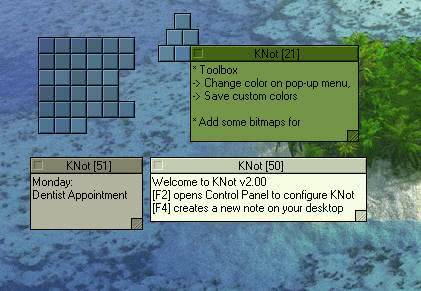 Knot is a small application that displays notes on the desktop. Those notes can stay on top if you want and you can start Knot with Windows so that your notes appear instantly after system start. It does have some fancy options like different colors and shadows for the notes as well as multi-monitor and network support. Users can create new notes by pressing F4 when a note is active which is my biggest problem with that application. I prefer a system wide shortcut that would create a new note instantly. The method Knot is offering is still better than the previous one using text documents. Does anyone know a desktop notes application that is lightweight and offers system wide shortcuts ? I would like to use an application that would create a new note whenever I press a keyboard shortcut and that would allow me to write down notes afterwards instantly. Quick Note,you can get it from the mozilla addon page. It only has two pages to put notes on,but im sure you can extend this,you can have it open in another tab-hover-or sidebar. try http://www.shirusupad.tk tiny memory footprint (660k), awesome ui and uses normal txt files to store it’s notes. believe me, i tried them all and this is the one and only. Same Phil, I use Shirusupad, it is a very good note for desktop, even you don’t need save text that you wrote (automatic save). Simple to use, just click system tray icon. Import/Export note, reminder. I tried several softwares before, only Shirusupad that I liked. even this doesn’t satisfy me. I want something like a note, like knot(why not, the concept looks fun) but where I can store images from the clipboard(or directly from the PrtScn). So many times I had to juggle with windows to copy information because they’re covering each other. It allows hotkey creation of new notes (Win+S) as well as lots of other functions. It’s free. I’ve been using it for years!